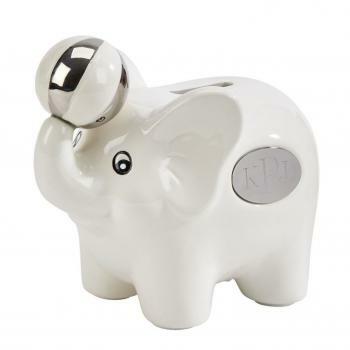 Make saving fun again with our ceramic Elephant bank! The bank can be engraved with a special name or initials for any occasion. Engraving on silver oval disc on side of elephant. The pig bank measures 5.25" high x 3.5" wide x 5.5" long. Plug at bottom to remove money. 5.25" x 3.5" x 5.5"